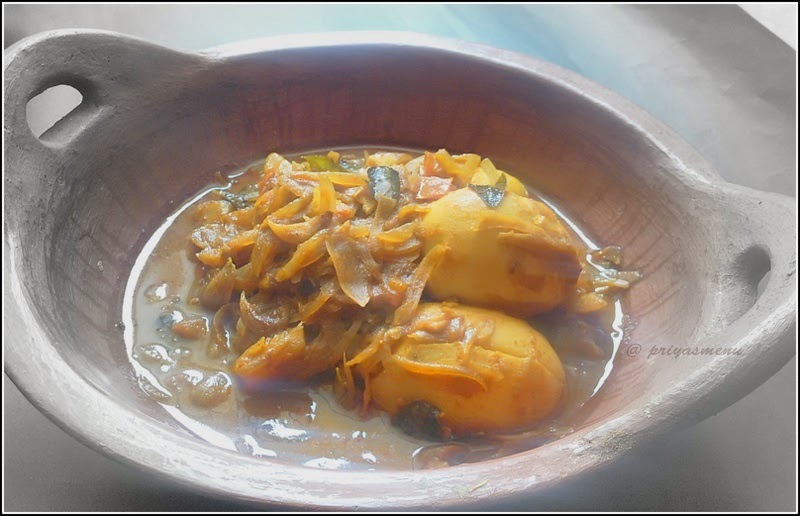 Here comes my one of my favorite cuisine recipe... Yes, I love Kerala cuisines and the aroma from their curry makes my mind fresh. 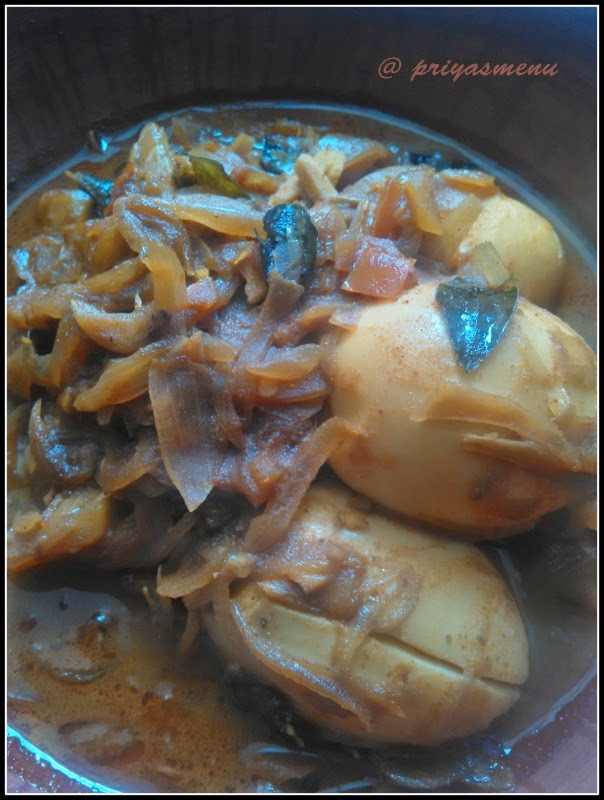 I learnt this from my neighbor during my stay in Kerala and though it has the same ingredients which we prepare for Tamil Nadu egg curry, the preparation method and fresh sliced ginger heads it to a different cuisine. I prepared this curry by adding coconut oil to get its authentic taste but can also prepared using regular cooking oil. The fresh ginger not only enhances the flavor of curry but also gives a lovely aroma while cooking. 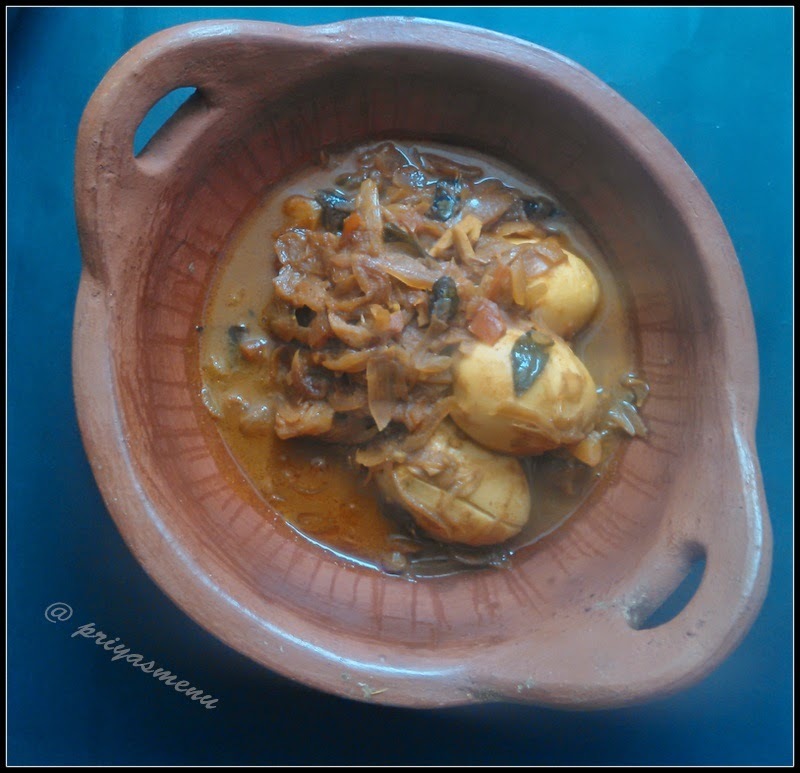 This flavorful curry is served with Appam and Puttu, which is a very famous food in Kerala but I served it with Roti and Rice in which I loved the taste and flavor when eaten with rice. Simmer the flame after adding eggs,so that the essence from the curry gets absorbed in eggs and gives very delicious taste. Coconut milk can be also added in this curry. Boil eggs and keep aside. Heat oil in a pan or kadai and add curry leaves followed by ginger. Saute for half a minute and add the sliced onions. Saute the onions till the color changes to light brown and add the chopped tomatoes. Mix well and saute for a minute. Add chilli powder followed by coriander powder, Turmeric powder and salt. Mix well and cook it for a minute. Now add water (approx 1cup) and let it cook for 5 minutes in a medium flame. Add garam masala at this stage and mix well. Cook for another 3-4 minutes and meanwhile, cut the eggs one side or prick it with the fork. 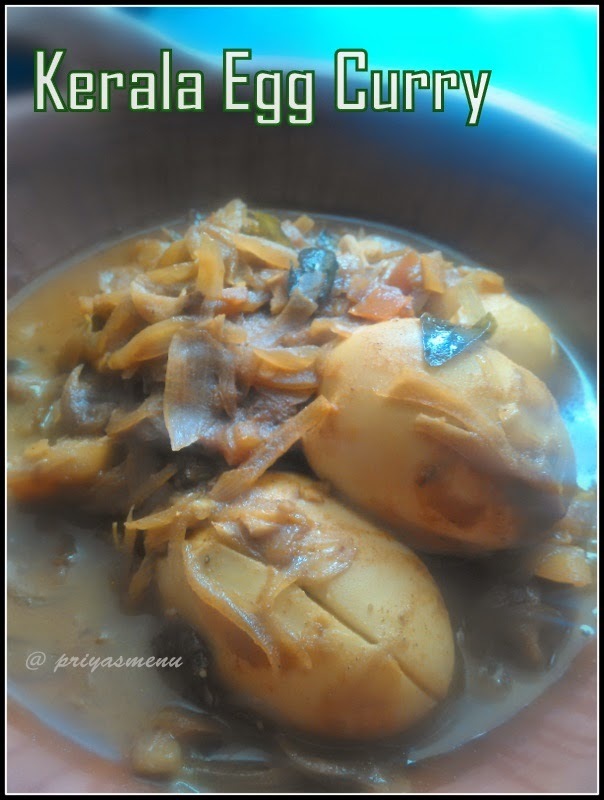 Place the eggs in curry ,slowly mix it and place the cut portion of eggs in the bottom so that eggs absorbs the essence from the curry. Simmer the flame and cook for 3 minutes. Switch of the flame and let it set for 5 - 10 minutes for extra flavor. Serve with Appam, Puttu, Idiyappam and Rice. Happy to follow you Priya. Do visit my space if time permits..